Quintessentially British design and exquisite craftsmanship combine with the vintage-inspired Emmy London collection. Crafted from gorgeous 18ct yellow gold, this elegant diamond ring showcases a dazzling display of set stones. A beautiful round cut diamond is surrounded by a sparkling halo, with the shoulders embellished with intricute milgrain detailing, cut-out features and baguette cut diamonds. A secret diamond sits upon the inside of the band, alongside the Emmy London signature. 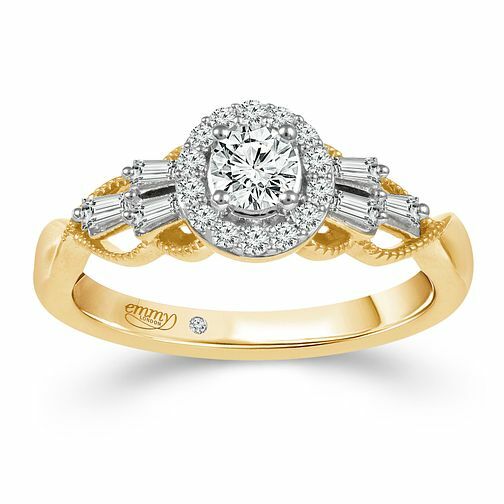 A classic set to captivate, the total diamond weight of this ring is 0.50ct.